Radio Frequency Identification (RFID) technology permits wireless, two-way communication between a smart label or tag and a reader. The core of the technology is the "transponder", usually made of polyester film with a printed or etched antenna embedded with a silicon chip. Apply a printed or printable face-stock to the top and you have an RFID tag. Add an adhesive to the bottom and you have an RFID label. 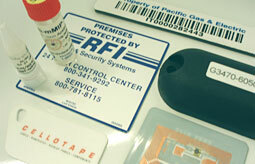 These "smart" tags and labels can then addressed by an RFID reader, also called an "interrogator". A polyurethane dome may be applied to the top surface for aesthetics or enhanced resistance to shock. A radio frequency absorbing elastomer may be applied to the back to defeat interference when applied to a metal surface.